Gorilla Grit Sanding Discs are designed with a reusable hook-and-loop backing that holds tight and won't give up. Our orbital sandpaper is resistant to loading and clogging, letting you work until the job is done. Gorilla Grit also features only the most commonly used grits so you don't waste money on discs you don't need. Whether you're a beginner or a seasoned professional, you'll love the quality and value of Gorilla Grit sanding discs. Only the grits you need. Save by getting the most commonly used grits for sanding, don't get caught with discs you'll never use. 80 GRIT (20PCS) - Great for shaping, carving, removing scratches, rounding corners and stripping paint. 120 GRIT (20PCS) - Finer grit for more control while shaping and smoothing. Smooths your material to a finish ready surface. 220 GRIT (20PCS)- Sanding between coats of oil, stain or sealer for a beautiful finish every time. BULK QUANTITY - Box includes 60pcs to keep you from running out of sanding discs on big jobs. 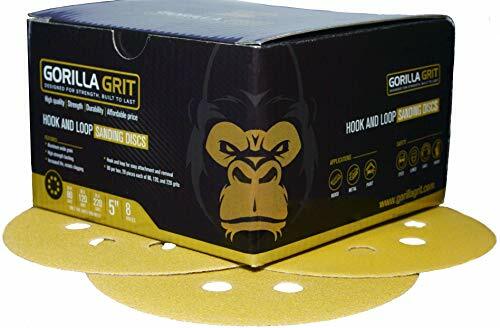 COMPATABILITY - Gorilla Grit Orbital sandpaper Fits all 5-inch 8-hole random orbital sanders including Black & Decker BDERO100, DEWALT DWE6421K, Makita BO5041K, and Mirka MID55020CAUS. GRAIN - Premium aluminum oxide grain that sharpens as you sand, keeping you sanding longer with each disc. Our Sandpaper Discs leave a consistent scratch pattern so you're pieces look beautiful with any finish. Great for bare wood, painted surfaces and metal. MONEY SAVING - Box include 20pcs of each grit (80, 120, 220). Our sand paper disc selection is hand picked to give you the most commonly used grits. We save you money by not forcing you to buy sanding discs of grits you don't need. If you have any questions about this product by Gorilla Grit, contact us by completing and submitting the form below. If you are looking for a specif part number, please include it with your message.